If you are wanting to make a longer appointment either because it is a chronic/complex injury or you are traveling from a distance please call the clinic for the pricing of longer appointments. Health cash plans are NOT private medical insurance; they’re a simple, significantly cheaper way of helping you afford your routine healthcare costs, including physiotherapy, dental, optical treatment and more. You pay a monthly premium, depending on how much cover you want, and when you receive treatment, you pay upfront and then send the receipt to the insurer and it reimburses you. Your plan will have limits as to how much you can claim in a year for each benefit for yourself (and dependents if included). With some plans, for a lower monthly premium, you can opt to get back 50% rather than 100% of your costs. Is there the option to cover partner/dependents and do they get full or shared allowance? How long after joining can I start claiming? Example: mum joins a cash plan, paying monthly premiums of £18.82 (her dependants are covered free of charge). Mum has to pay for her twice-yearly dental check-ups and at the second she needs a filling. Son Sam injures his shoulder playing rugby, requiring three physio sessions and Millie’s dance teacher recommends she see a podiatrist. Later, Mum decides she needs a spare pair of reading glasses and poor Fred has to have his appendix out, requiring a two-day hospital stay, with mum using NHS car parks whilst visiting. Total healthcare costs for this family for the year were £502.70. 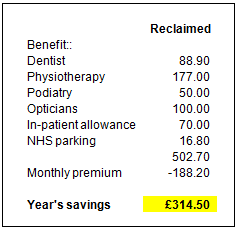 Cash plan premiums were £188.20 (two months free for the first year) meaning a huge saving of £314.50. And that’s without using other benefits included such as private specialist consultation, chiropractor, homeopath, NHS prescription charges, and more. Considering how good value these plans are for people who claim, it stands to reason that the only way the providers can be making a profit is by relying on those who forget to claim.. Cash plans are great value, but only if you’re organised enough to make the claim in time (usually within six months). Also, make a note of the plan’s year end. Benefits unused are not rolled over to the next year, so if your cash plan year end is April and you need an eye test/dental check-up, if there’s still money to claim, make sure you book in in April, rather than waiting until May.